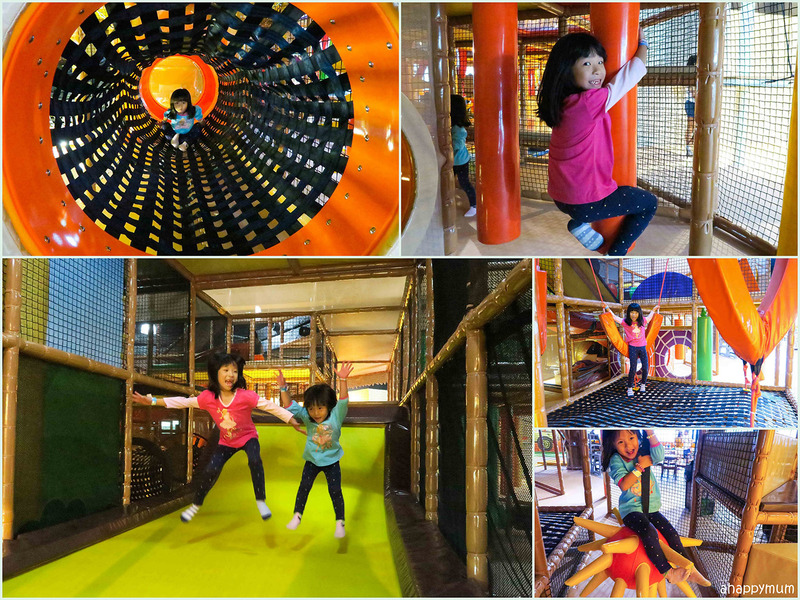 We love indoor playgrounds. Well, which kid and which parent doesn't? 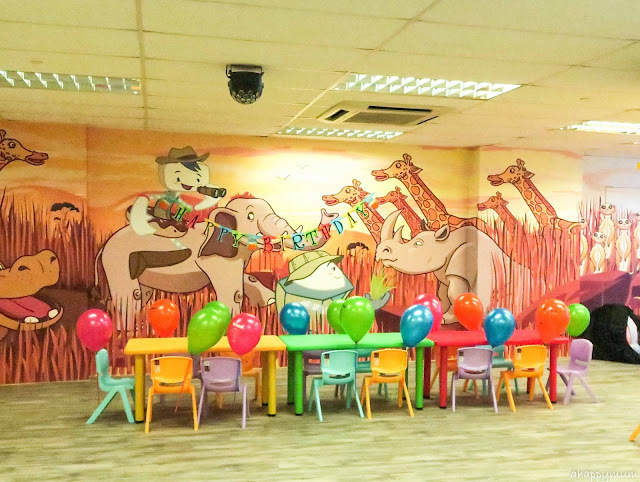 It's one of the best and easiest places to bring your kids, knowing that you will not be affected by wet weather, your child will be in a childproof and safe environment, your kids of different ages will be entertained, you won't have trouble finding a diaper changing station, and if you are lucky (and do not have a baby who sticks to you), you might even be able to chill out at the café and relax over a cup of tea. 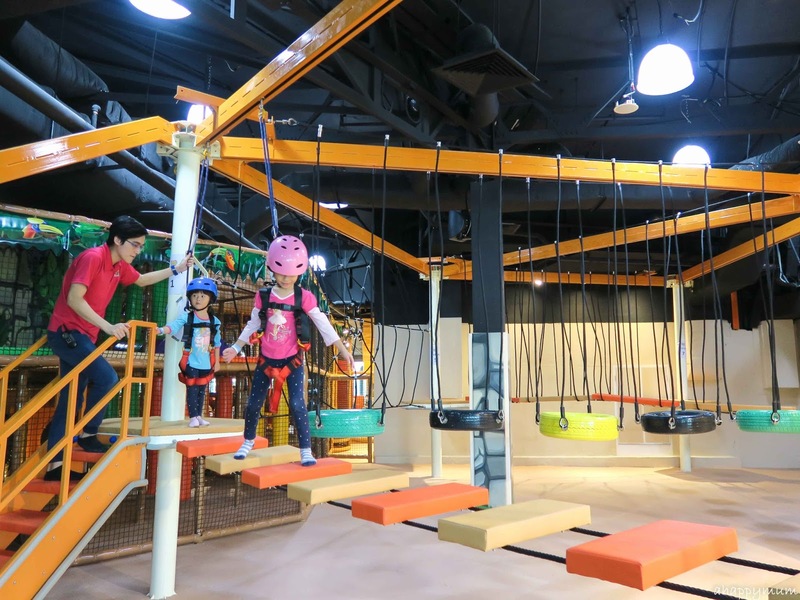 Now, what if there is a playground that enables your child to learn through play, overcome obstacles and build up a sense of confidence in the midst? 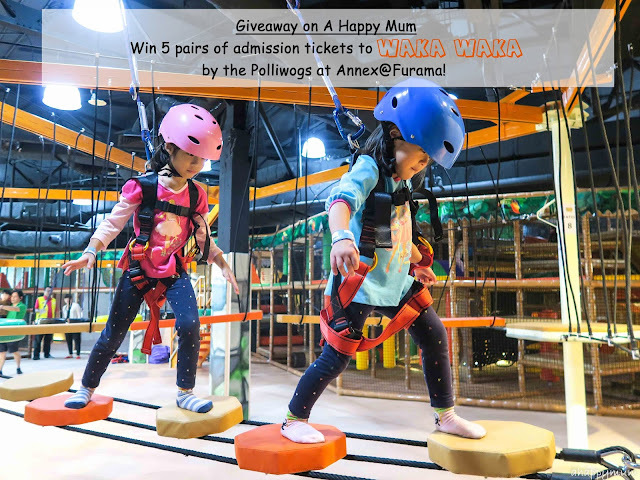 When we heard about the newly opened Waka Waka by the Polliwogs which has an unique concept with a Safari theme, I knew that we had to give it a try. 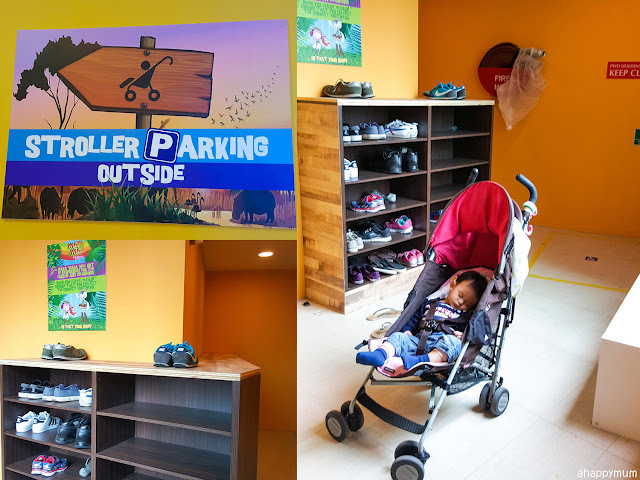 Situated at Level 5 of Annex@Furama, which is next to Furama Riverfront Hotel, I can't say that this playground is easily accessible, especially for mums like me who usually travel by public transport. 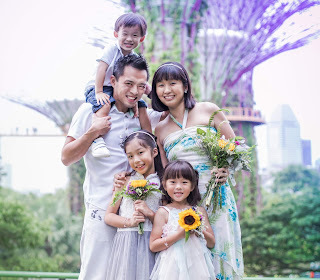 The nearest MRT station is Outram Park and a walk on foot took us around 20 minutes, which can be quite unbearable especially if you are pushing a pram with a baby and holding onto two other kids on a hot day. If you can, do try to take a bus so that you don't have to walk so far or better still, drive or get the hubby to fetch you here. Once you get out of the elevator, you will see the entrance to Waka Waka. The shoe rack and stroller parking area are outside of the main entrance, which means that you will need to change into your socks and leave your shoes and stroller outside before you can enter. The area is a little cramped and I did think it would be better this was placed inside of the premises so that we could sit down and get ourselves ready without having to perspire all over. The moment I entered the place, I was blown away by the sheer size of it. It must be one of the biggest playgrounds we've been too and we were just too excited to start exploring every corner of it. Let us show you around! 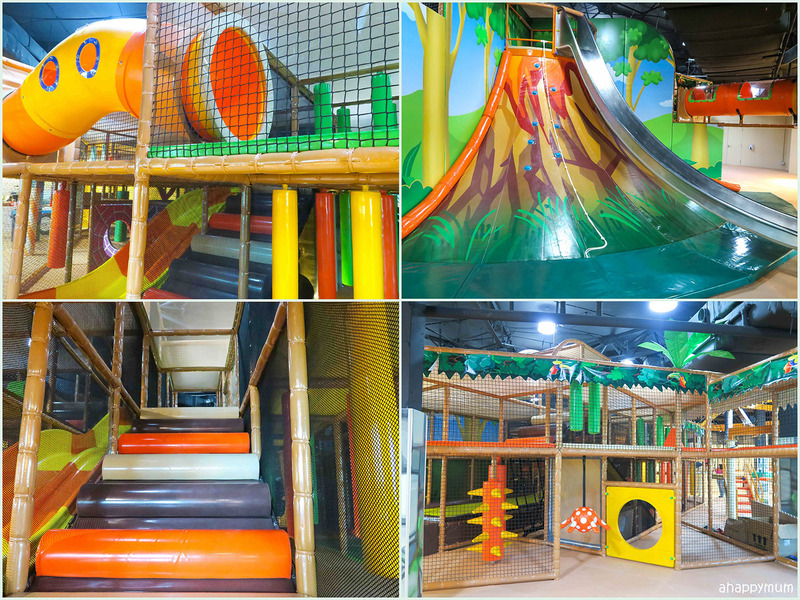 The Junior Area is catered for babies and toddlers below the height of 90cm, although there is no strict rule that older kids can't play here too. I usually find that this area tends to be limited and small in most playgrounds, so I was pleasantly surprised to see that the size was decent and there was an array of activities to occupy the kids. In fact, we spent nearly half an hour here because the kids were too engrossed in trying out everything they saw. 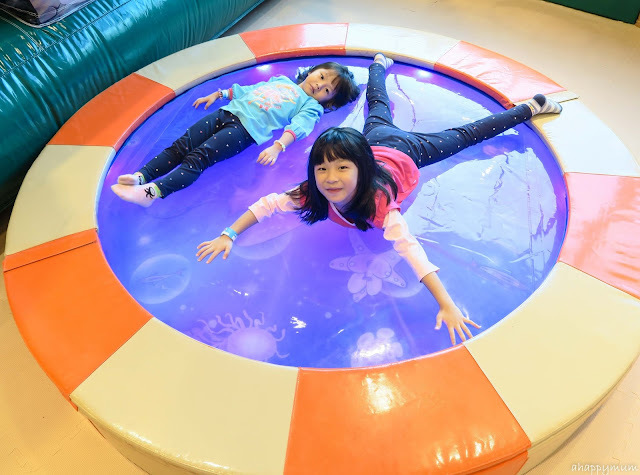 Besides a fun, big bouncy castle complete with a slide, there are also sensory wall panels, a brick house for you to build, a slide with real water in it and a water bed that works like a trampoline and you can even find sea creatures below. How awesome, right? I seriously think my baby can stay here for hours and not be bored, and the sisters will be equally happy to stay here with him. That is, before they go on to explore the rest of the playground and discover what more it has to offer. 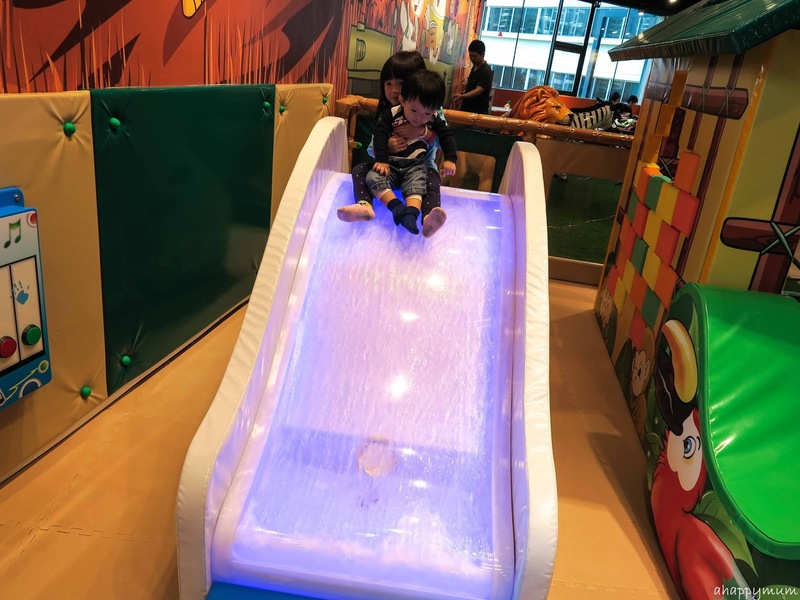 The main play area is meant for the older kids but babies and toddlers are welcome too, as long as they are under the supervision of an adult. 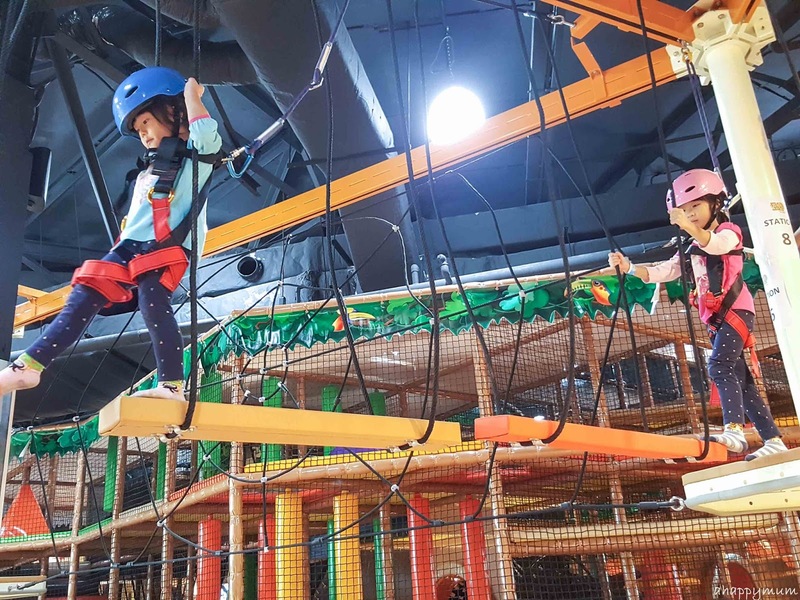 In this multi-tiered structure, you can find trampolines, tunnels, wave slides, spiral slides, balance beams, boxing bags, swinging balls and more. 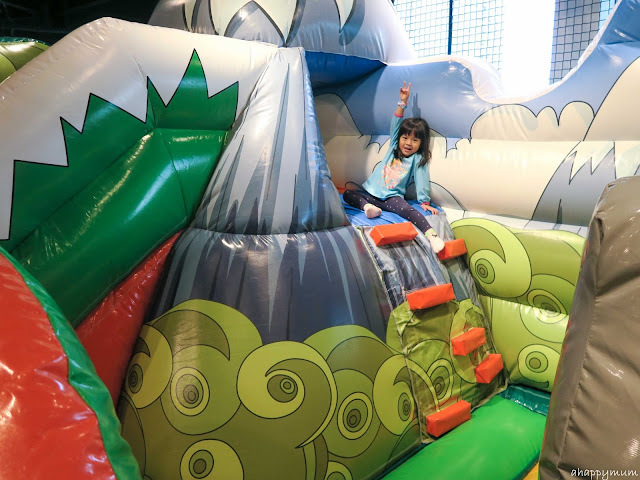 Our favourite part of the main play area has to be the "volcano", where kids can try to climb to the summit using the ropes provided. There is a long, steep slide in the middle and two climbing lanes - one on the left of the slide and the other on the right. The left one has a rope and grips to assist you while the right one only has a rope. Remember I said that this Waka Waka emphasizes on helping kids to instill a sense of confidence? I think our journey began from here. I saw how the girls tried their best to scale the volcano, how they failed the first couple of times, how little sister got stuck halfway and the big one tried to help her, how they had to pick themselves up and try again. I have to say that the volcano surface is very slippery (and it makes a great slide, which you can see in my video later) and it's not easy even for an adult. So you can imagine how much effort it takes for the kids to conquer it. We were treated to an interactive and engaging show by one of the Polliwogian characters - Larry the Robot, who kept the children entertained as he played games and even taught them how to dance. My girls don't usually volunteer and raise their hands to answer questions, but that day they both did and I was glad that Larry picked Ariel to answer the question and even rewarded her with a sweet after that. We were told that these shows take place weekly, so do check with the staff on the day and time if you are interested to catch it. 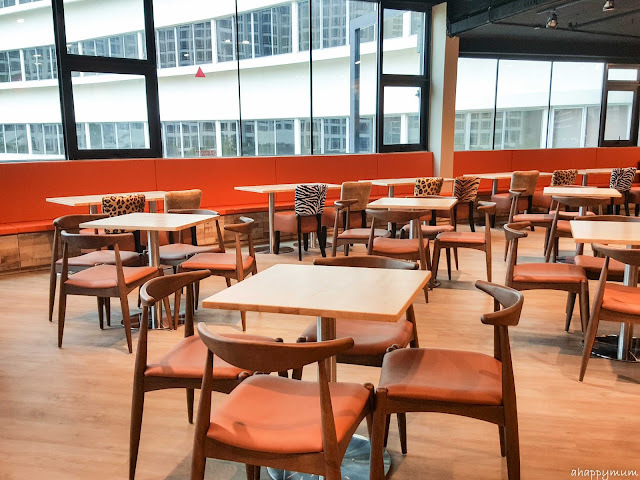 For parents who are able to chill out while the kids have fun, there is a spacious Parents Chillax area at the café where you can enjoy free Wi-Fi too. I love that huge, colourful toucan beak that juts out and lets the kids have a glimpse of where Daddy or Mummy is. In the café menu, you can choose from a wide range of food including pizzas, sandwiches, mac & cheese, hotdog, pasta, soup, fries, burgers, salads and more. Unlike some outlets where you have to exit the playground whenever your child needs to pee, here in Waka Waka, the toilets are located inside the premises. 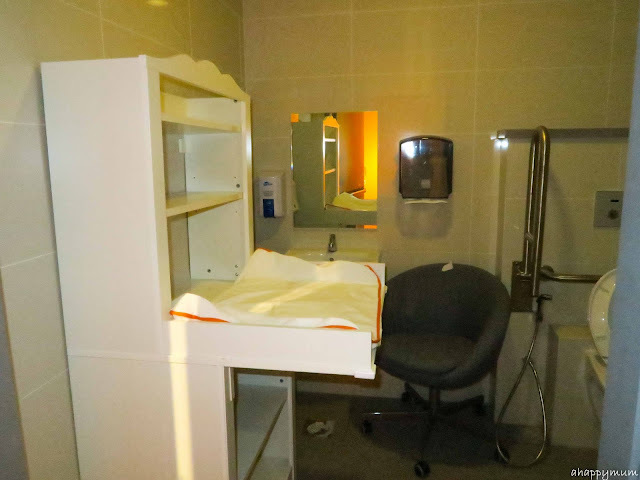 You get to enjoy a beautiful African sunset view when making your way to the toilet and there is also a diaper changing/nursing room for those with little ones. Yes, phew! Party rooms are also available for those who wish to hold a birthday function here. 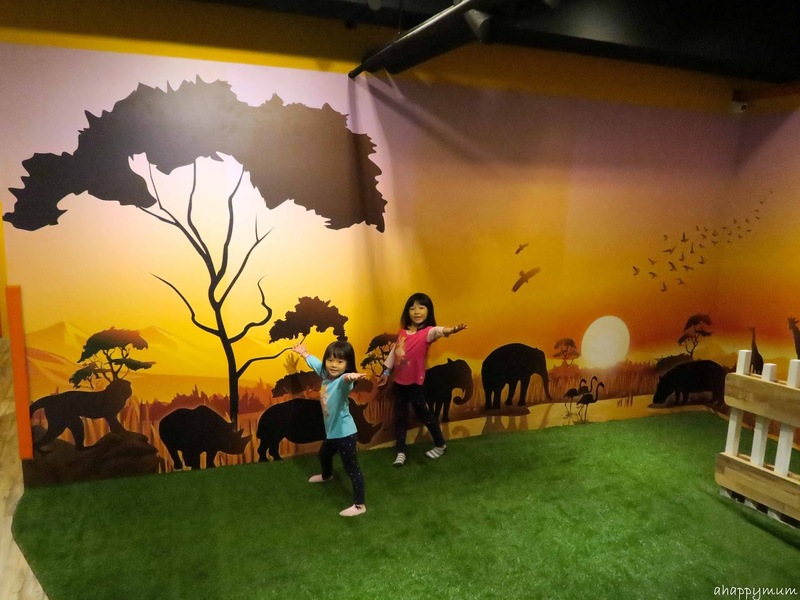 The rooms even come with safari-themed wallpaper and it definitely creates a wild and fun jungle ambience. Now, let's move on to the highlight of our day! Kids who are aged 4 or are taller than 90cm can participate in the Waka Adventure Cove which consists of a series of challenging activities. Do note that additional fees (see below) will be incurred if your child wishes to try out these activities. So my kids have never really been on any forest walks or any activity that requires them to put on a harness, except for the trampoline which the big sister when we were in Clud Med. 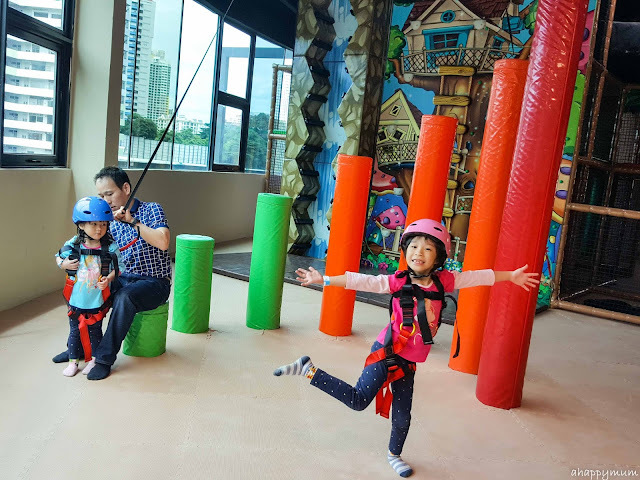 We were just waiting for the right time and now that they are turning four and seven this year end, I was jumping for joy when the staff at Waka Waka told me that they could join in all the adventurous activities. Safety comes first and it was a relief to see that the staff were very patient in helping them to adjust their harnesses and pick out fitting helmets for them. Okay, it was purely a coincidence that the colours of their helmets matched their shirts that day. 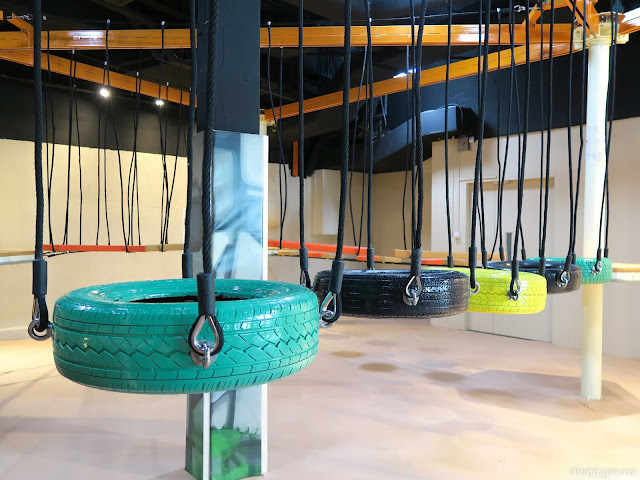 In the Rope Adventure, which parents can try out too if you would like to, you are tasked to walk through a course, overcome a fear of heights and test your sense of balance and coordination. I have to say that it was a breeze for the big girl who had no problem at all and easily made it to the end and came back. She did tell me afterwards that she was a little scared but then again, she didn't show it at all and managed to outdo herself. As for the little girl, who by the way looked tiny up there, she did everything to the best of her ability and didn't even need to me guide her for most of the course. BUT, when she got to the part where there were no ropes at the side for her to grab onto and she could only stretch out her arms and balance herself in the air, she got terrified and wanted Mama to hold one hand before she found the strength to carry on. Still, you did a great job there, my dear! For the Totem Challenge, which the girls insisted on trying though we didn't anyone else doing it, you are supposed to climb up a series of ascending beams and then take a leap of faith when you get to the top. Was it tall? You bet. In fact, the uncle who was in charge there (and was very friendly and nice to us) said "This one is only for the brave kids". And when he turned around to look at the girls, I suppose he cast his doubts yet he was very willing to let them try. At the end of it, when he saw how Angel climbed to the very last beam and how even Ariel tried to make it to the halfway mark, he turned around and said "You have very brave kids." Well, these kids even tried to convince him to let them try for the second time! Yes, may you always stay resilient and don't be afraid to take risks, my dears. 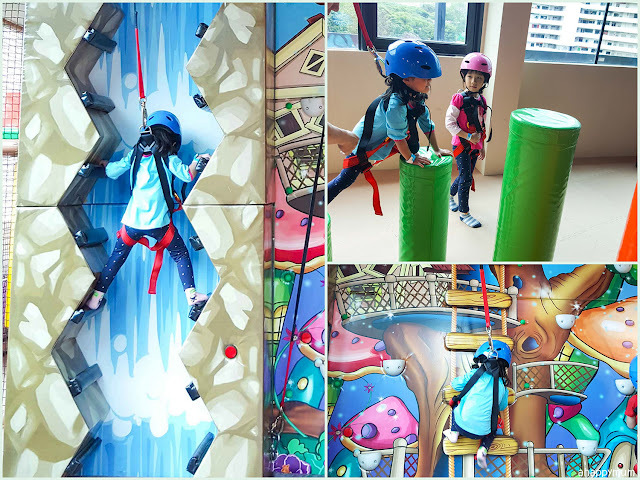 Lastly, we also tried out 3-themed wall climbing because these kids were so determined to try out everything they saw. In this wall, which has a beautiful wallpaper of a tree house on the right and a waterfall on the left, you are supposed to fight against the current and scale to the top using the steps and climb to the top of the tree by using a ladder or wall holds. 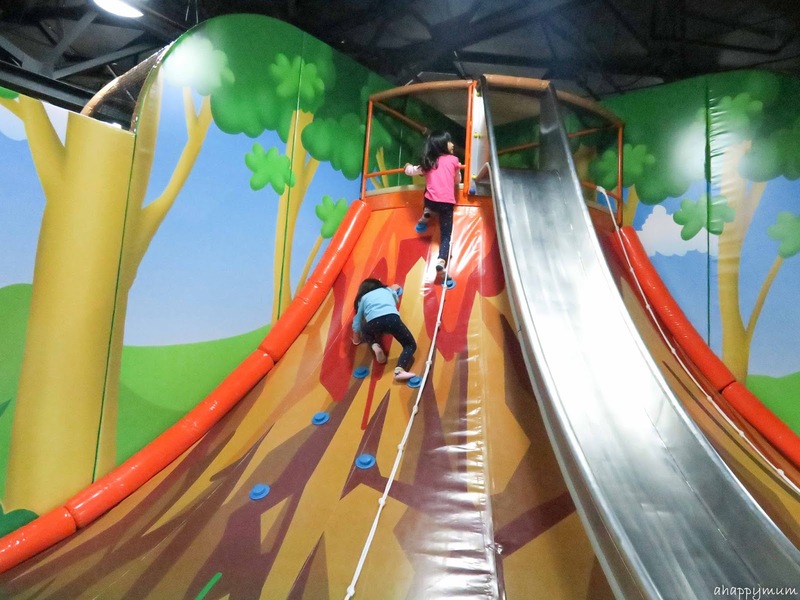 The wall is 2-metre high so for kids who are not so tall and don't have long limbs, it's definitely going to be a challenge to get to the top. What makes it very fun is that you can race your friends as there are timers installed. Once you hit the red button at the bottom, the time starts and you have to scale to the top to press the second red button to stop the clock. So fun, right? I was very impressed by how Angel did everything in style and also wasn't afraid to push herself off the wall when coming down. I seriously didn't know she had it in her and she told me she found it all very fun and interesting too. 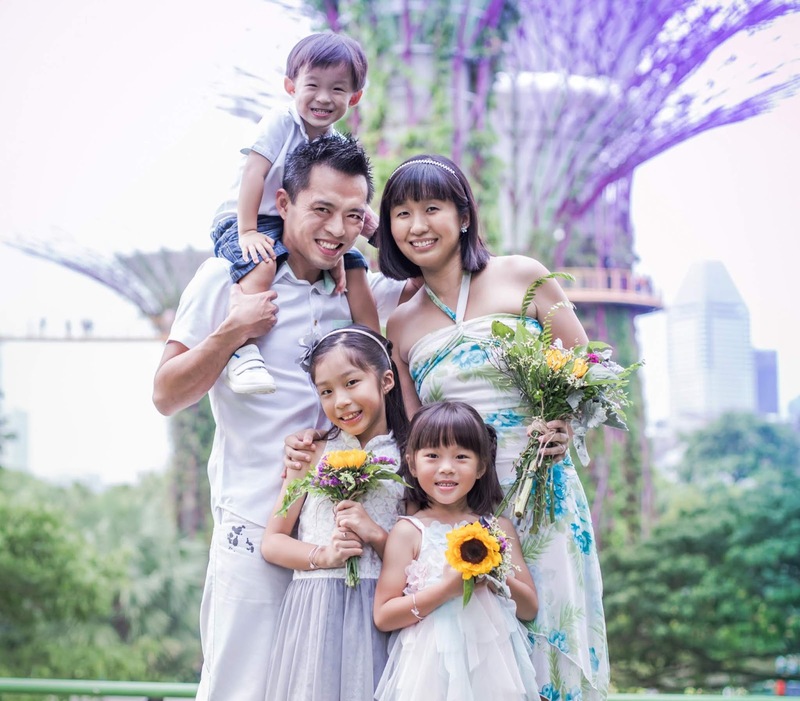 As for Ariel, well, this little one wanted to do everything that jiejie did. It's nothing unusual and the only thing I wanted to do was to encourage her to try her best too. She did half of everything before she gave up and I have to applaud her for the effort! Now, it's not easy to put all our experience in just pictures and words so if you will, watch this video just to see what we actually did and all the fun we had in Waka Waka! So, we have officially concluded that this is our favourite indoor playground for now and the girls are already asking me when we can come back here again. Very soon, my dears, very soon! 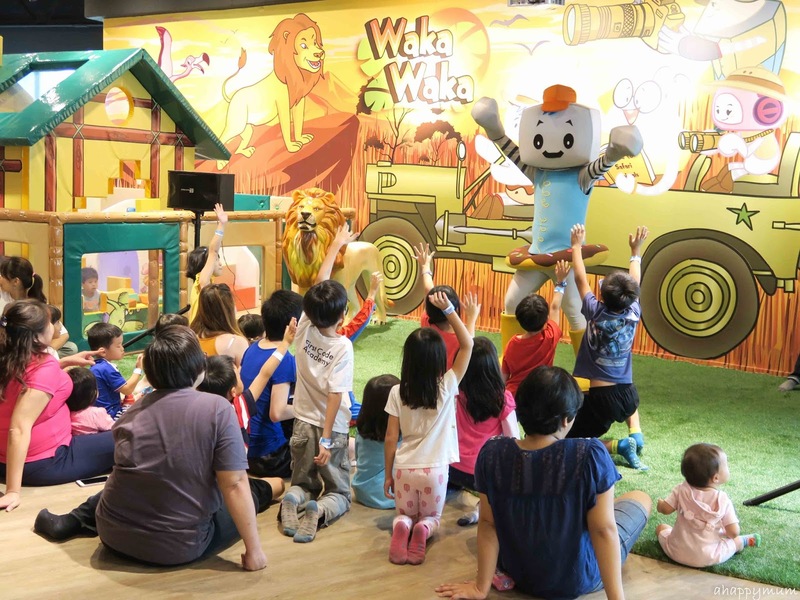 For those of you who are thinking of where to visit this school holiday, do consider paying Waka Waka a visit and I hope you will enjoy it as much as we did! - Waka Play Pass 12 + 1 additional visit! 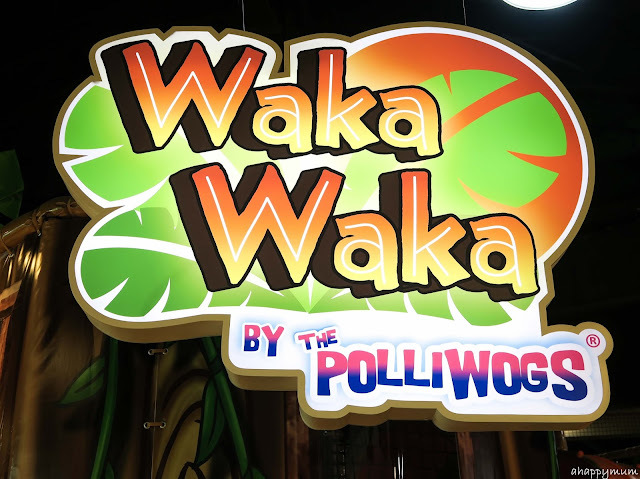 *Existing Polliwogs Value Play Pass Holders may also redeem your visit at Waka Waka. Present your Value Play Pass at the front counter to redeem your visit and top-up at a special exclusive price of $7 to enjoy the play session. Terms & conditions apply. For more information and updates, visit Waka Waka's Facebook page. Good news! I am giving away 5 pairs of passes to Waka Waka by the Polliwogs! To participate, leave a comment in this blog post with your name, email address and tell me what you love most about Waka Waka. Indicate that you have done so below and to increase your chances of winning, you can choose to carry out the rest of the options. Winners will be notified via email and collection details will be advised at a later date. Best of luck! a Rafflecopter giveaway Disclosure: We were invited to the media preview of Waka Waka. All pictures, video and opinions are our own. I hope to win the waka waka for my 4 years old son! He loves indoor playground! 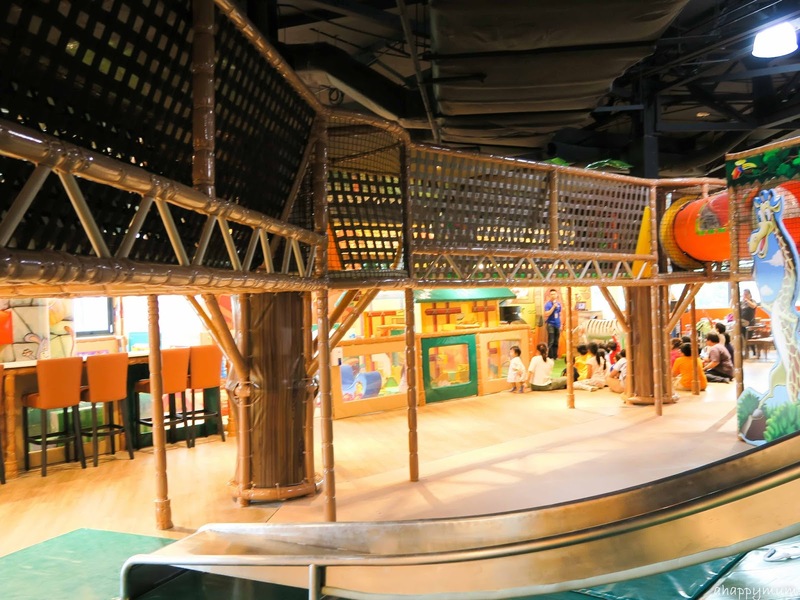 I'm sure waka adventure cove will be The best hit among my three boys! What I love most about Waka Waka are the VOLCANO ROPING & SLIDES. 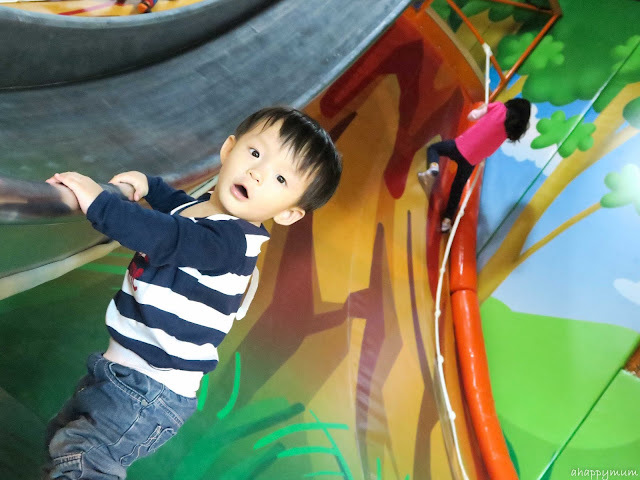 May seems difficult to reach to the top, but with help from the rock steps and some encouragement (or a gentle push from us parents), my son will definitely love climbing this volcano roping over and over again together with the thrill of sliding down from the top of the Volcano! Well, an indoor playground must have – SLIDES AND MORE SLIDES! Can't wait to enjoy the exciting slides we can find here! We are sure to have our thrill of coming down from one! We love Waka Waka bacause they have something for everyone! My 2 years old toddler can rumble and tumble in the Junior Area and my 7 years old boy can challenge himself at the Adventure Cove! Even the parents get to chill at the cafe! My triplets and nephew will so love the rope and wall adventures! So happy to see your review of the place with action pics of your girls. I can imagine the kids having so much fun there! My kids and I would love Waka Waka as it is fun, adventurous and something new. We would have an enjoyable time. Waka wanna win this for my 4 year old son who loves any indoor playground! 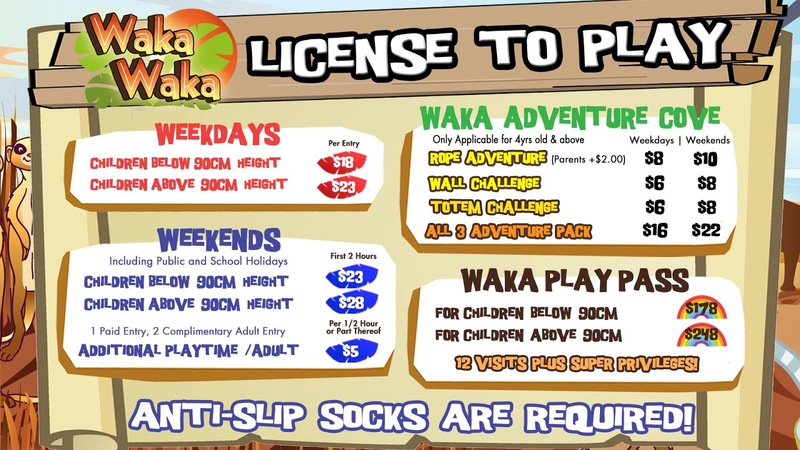 I love all those adventure obstacles catered to the kids and the neverending joy provided by Waka Waka. A great place to drain my kids boundless energy and to build up their confidence and interactions with the other kids. Hope to win this giveaway and bring my 2 little monsters for a family bonding time. They sure gonna like the ROPE ADVENTURE! Fathima Fjjs1092@gmail.com it's safari themed! My daughter loves animals! I love it that the programmes are for different age group as my 9 years old is bored of the usual indoor playground. I love the adventure wall. Even I myself find it so tempting to climb!! I love most is the Adventure/Challenge activities. 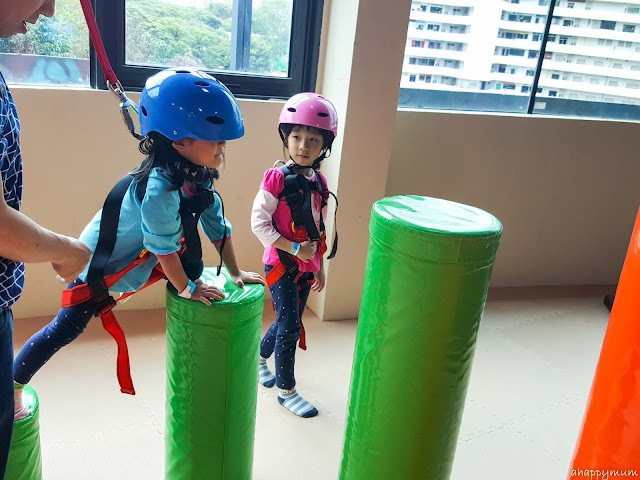 I find it gives kids a safe environment to improve their motor skills, build their confidence, and have fun while at it! 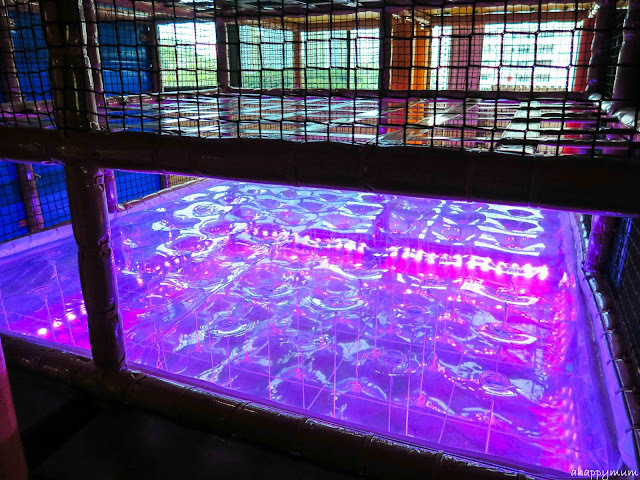 The water bed is an awesome feature and I think kids would really love that! Yes please! Some safe fun for kids to expand their energy on, other than on me. 😅 I like the obstacle course like play area, as it pushes kids to go beyond what they think is their limit. 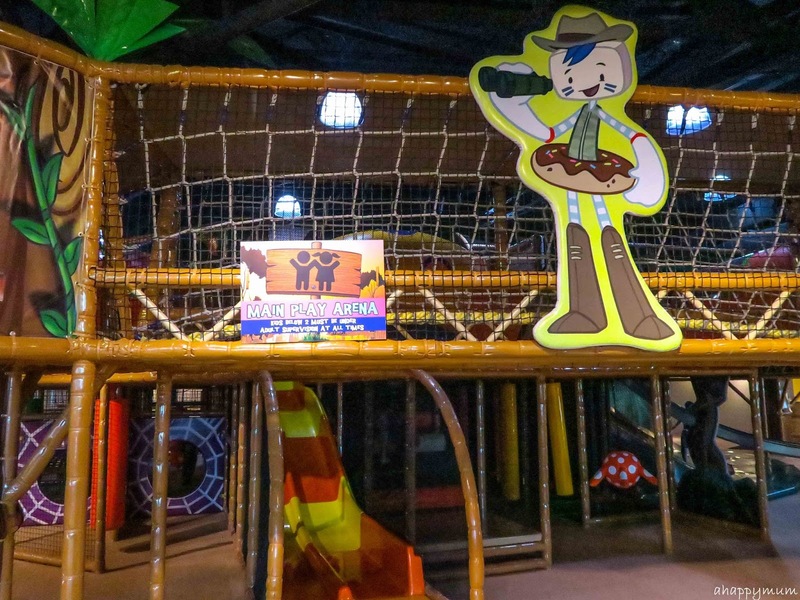 It is a bit different from other indoor playgrounds as it caters more for the older children which is perfect for my boy. I love the bright colors and safari theme of waka waka! My son and I would love the rope adventure in waka waka! What I love most about Waka Waka is the adventure activities that you can't find at other polliwogs. It was my boy's first time to Polliwogs Vivo City last night and he enjoyed it tremendously! I googled Polliwogs to read up reviews on other Polliwogs branches and stumbled upon your website which is super helpful! However, he does have slight confidence issues when it comes to scaling heights (think he is afraid to fall!) and I saw in your entry that in Waka Waka, there is a sensory wall panel which I think can help to boost his confidence. So here's hoping we would score the free pass! Thank you very much! My boy would love the rope adventure! This looks awesome. I know my four year old would be thrilled with the volcano! I doubt my two year old would be able to stay put in the Junior area, he'd want me to bring him to the main play area for sure! 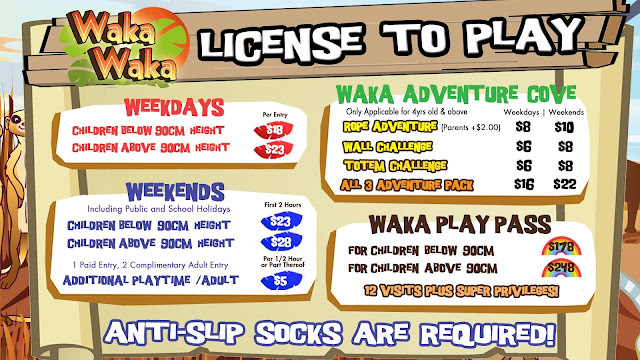 My boy would love the Waka Adventure Cove - Rope Adventure section as the usual indoor playgrounds do not offer this. The harness will give him a little more confidence to try it out. This place simply look fun. Even the mother is excited so how will the kids feel. Dashing in to every corner and trying out everything. Having 3 kids, they will each like one different session. For the elder boy he will like the Rope Adventure and my 2nd son and youngest daughter (being a tomboy) will climb the Volcano like how they always climb the slide. I had plans to bring my son on his bday next week to celeb with his baby sis and cousins! hopefully this giveaway will be a good pressie for him! thanks much for the info on the place! Thank you very much for sharing the place :-) We love the Waka Adventure Cove most. Wow simply looks full of fun & adventure & many things for kids to explore & enjoy. My gals is especially excited about the Rope adventure & looking forward to the fun. Thanks for hosting awesome giveaway. 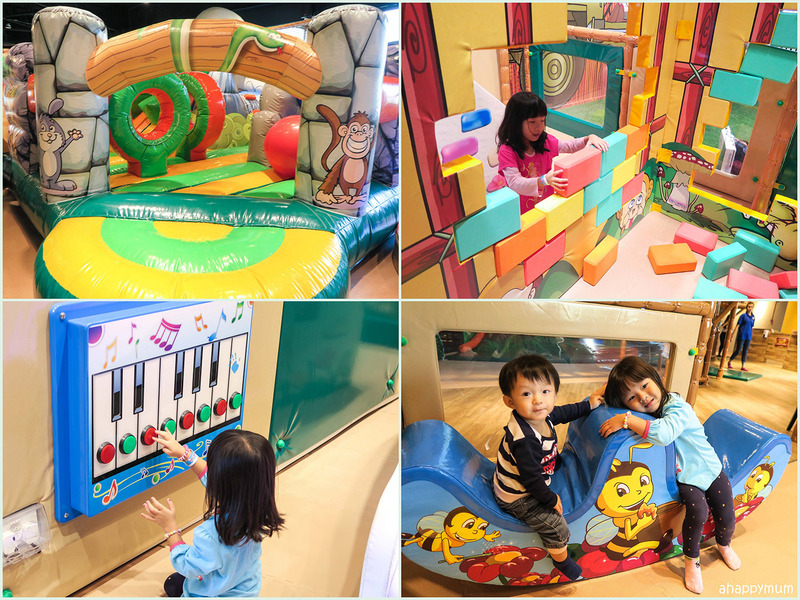 I like the fact they have performance which keep the kids entertained and they can take a rest for a moment. 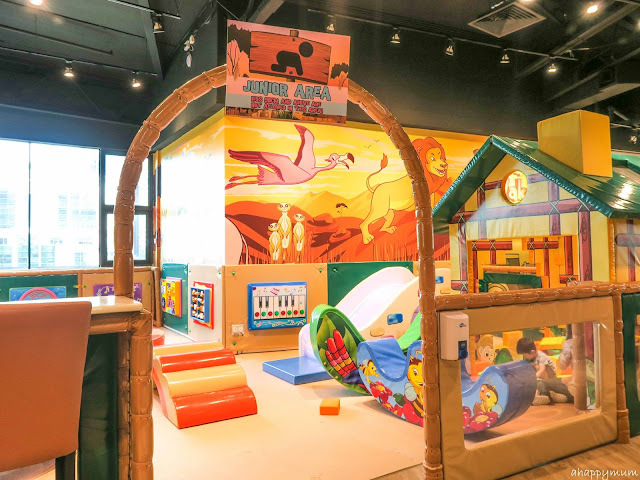 By looking at the pictures and the way you describe the place tells me this oulet will be a great outlet for kids to play and learn. The kids at different age group will be able to actually try and explore the outdoor elements and that can actually boost their confidence if they manage to complete the obstacles. 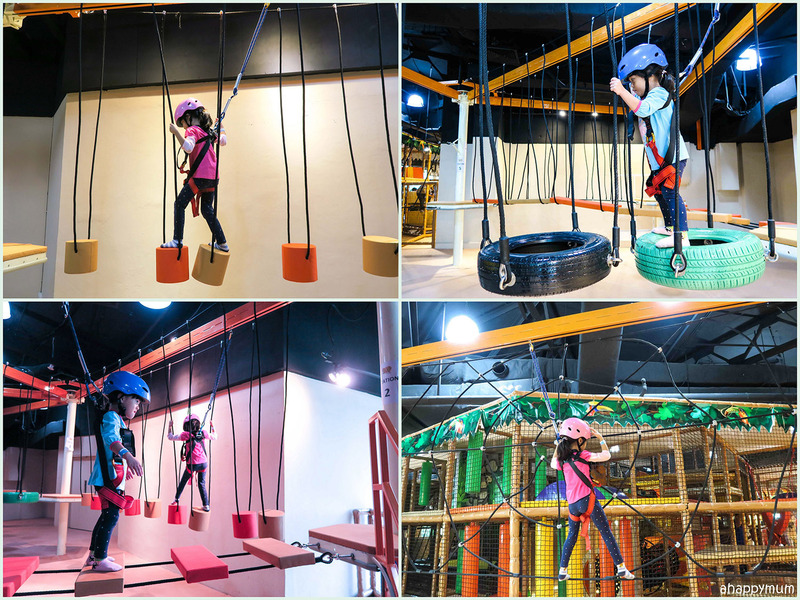 I would love to bring my kids here for them to explore and build their confidence especially on the Wall and Rope Adventure! 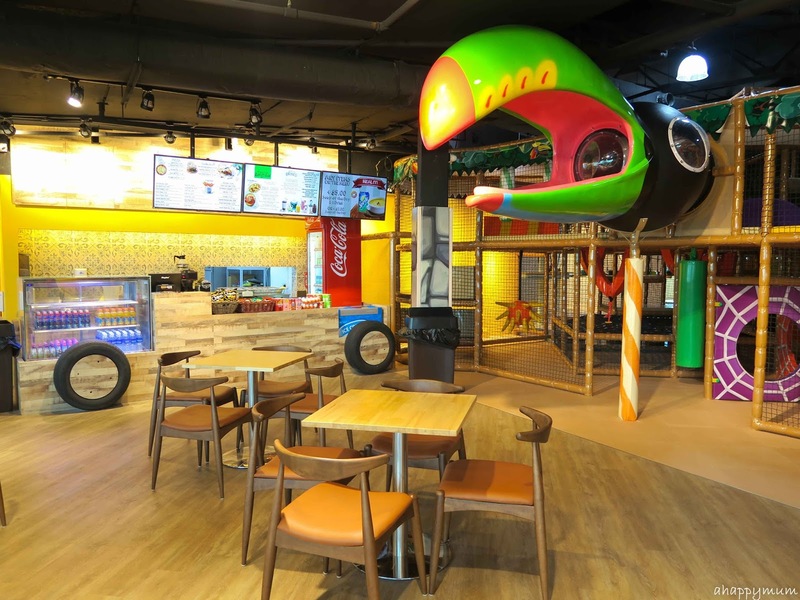 As a parent, I love that the place is easily accessible via public transport, and the toilets are located inside the premises. 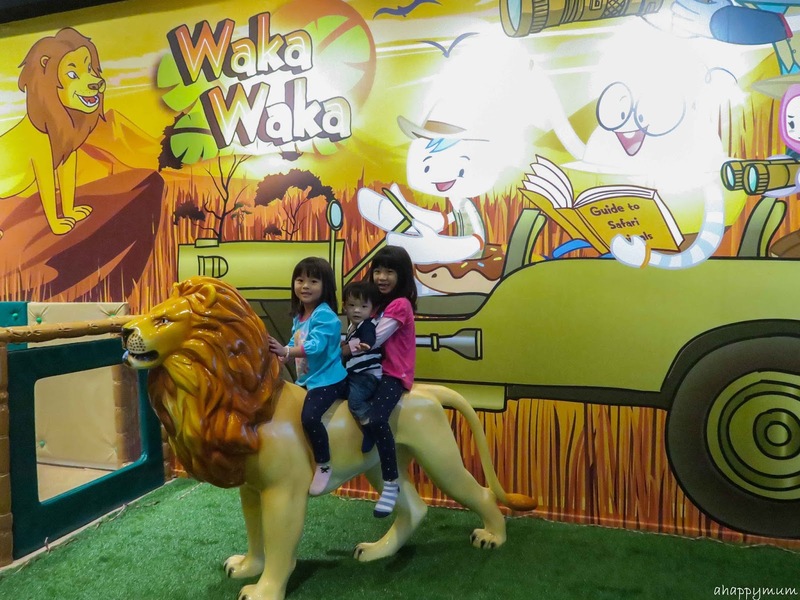 We love Waka Waka as the kiddies are very adventurous and really love climbing everywhere, like monkeys!! 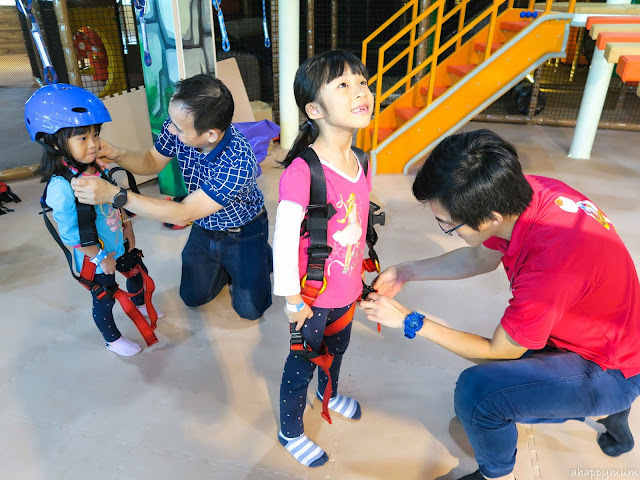 The Junior area and the Adventure Cove would really test their capabilities and make it fun for them at the same time.